These handcrafted needlepoint Poodle Cosmetic Bags make unique Poodle gifts for your dog walker, vet or dog groomer! 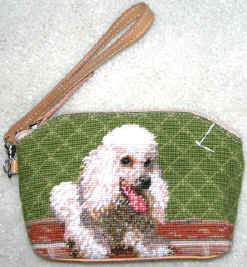 Elegant Dog Gifts, Including Needlepoint Poodle Cosmetic Cases. The Ultimate Shopping Mall for Dog Merchandise and Poodle Gifts. Select a Dog Lover Gift from OVER SIXTY BREEDS of Man's Best Friend!! See our Other Needlepoint Dog Accessories!